As you know…I pack lunch for my 4 almost every single day and usually its some sort of HOT LUNCH in their thermos. 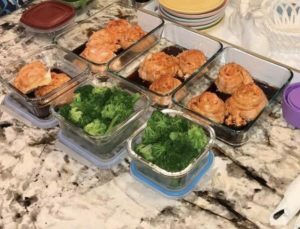 I usually try to cook something simple….so I can pack it for us in the morning. I try to prep everything on the weekend so that making lunch at 5:45 am every morning is quick. Sometimes the kids lunches are left over from the night before but USUALLY its NOT because we don’t have much left over for 6 people. I try to make something that is easy to travel and PACK and doesn’t take a lot of containers. Pasta is usually our go to or fried rice. When it is cold…I try to make some type of soup item. 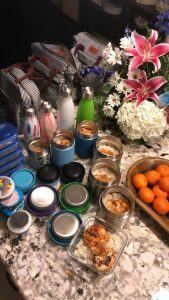 I love the thermos that I got because the opening is very WIDE so when I am packing it in the morning…its so much easier than trying to scoop things inside with a big ladle or serving utensils. 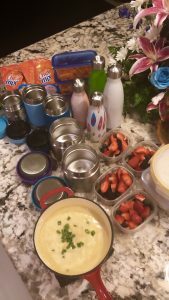 My kids also said they like the wide opening because its easier for them to eat out of….plus its shorter so the plastic utensils doesn’t get lost in the thermos. I link the thermos that we used. I have used many different brand and type and I found these 2 works for my family. Many negative comments about the thermos that I used is that the seal is so tight that it makes it hard to open sometimes. I found what have been working for us is when I am sealing it in the am. Once I tighten it….I WOULD UNTWIST it by another 1/4 turn …kinda loosen it a little. The seal is still tight but it doesn’t PUT a suction in it. When the food is HOT…it creates a TIGHT SEAL so you want to loosen it a little. When you order the thermos….they will send you a FOLLOW-UP email explaining the process to you …just read the instruction and YOU WILL not have a PROBLEM with it. 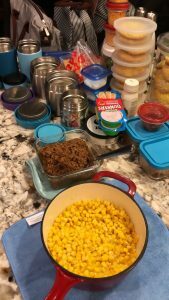 TACO Thursday: I would put the shells (hard or soft) in a ziplock bag, sour cream and Mexican blended cheese in a little container…BUT sometimes the kids or OK with it on top of the taco meat…SO… in the thermos I would put some corn on the bottom then the taco meat….next, the cheese and then the sour cream. My kids like to mix it up anyways and spoon it over the shell or inside the soft taco and roll it all up. They LOVE TACO days!!! Wonton SOup is usually on repeat in our household for SCHOOL LUNCH. 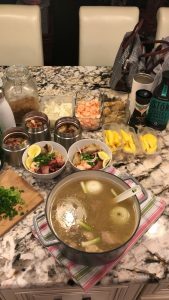 What I usually do during my meal prep is I would cook the egg noodle, saute the shrimp, cook up the char sui meat, precook the short ribs (sometimes I would even make the broth the night before…let it cool down and STICK the whole pot in my refrigerator and in the morning …I would just put the whole pot back on the stove for reheating. I would assemble the thermos with a layer of noodles then add the potsticker (wonton), shrimp, and char sui meat in the thermos and once the broth is HOT…I would ladle the broth in the thermos and DONE!!! SUPER EASY and it’s delicious…ESPECIALLY on COLD or RAINY days. I alway pack the kids some sort of fruits…cut up strawberry, sliced grapes, mango, kiwi, and mandarin (cuties) orange. I don’t usually pack apples or pears because they get brown and the kids don’t like that. I also never pack BANANAS. They bring their drinks in am insulated water bottle that I get from HERE. I WILL try to update my SCHOOL LUNCH ideas as I go along during the school year. I just found that this process works for me. Packing the kids LUNCHES only takes me about 30-45 minutes in the am…and that included COOKING the meal too!!! Always remember to pack utensils and napkins for the kids lunch. I just buy disposable one. These are all such great ideas, Felicia! Thank you for sharing them. 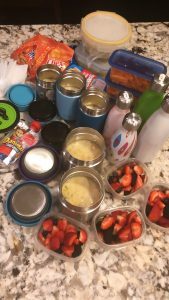 I was wondering what type of lunch boxes/bags do you and your children use? I am looking for a good one that is not too small but at the same time is not too big. Diane.. I just got these lunch bags about 2 weeks ago.. so far the kids LOVE THEM!! I will link them for u tomorrow night with my new blog post.